In the summer of 1836 the Rev. 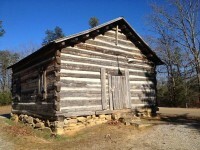 Thomas Morrow, a licentiate of old Tombeckbee Presbytery which comprised what is now East Mississippi Presbytery in the Synod of Miss, and adjoining portions of Ala.) came to Pickens County, Ala. and commenced preaching in a small school house near Mayerhoof’s Store, afterwards Franconia. Public worship was generally conducted under a brush arbor until they could erect a suitable building. A beautiful site was selected near Mayerhoof’s Store, a house of worship erected, a cemetery enclosed, and because the place was surrounded with beautiful oak trees it was called Oak Grove Presbyterian Church. 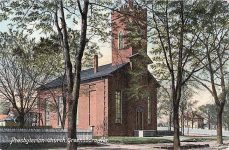 This building—one of the finest of this denomination of the county—had a high pulpit, a broad middle aisle with benches on either side; those on the left being occupied by the men, while those on the right were reserved for the women and children. There were no heaters and on cold days heated bricks and foot warmers had to be brought from home. Soon after its organization Mr. Morrow and the church were transferred to Tuscaloosa Presbytery, Synod of Alabama. A bench of five elders was elected, all of them having held this office in the churches from whence they came. Their names were: John Hughes, John Summerville, Archibald Hood, John and Abraham Turnipseed. Every preaching service brought additional members by letter and by examination. In 1838 John Knox was elected an elder and became the first clerk of the session which office he held until Dec. 1861. Wm. Kesley and James McGowan were the next elders elected. In 1842 the first Deacons were chosen. They were: Eli T. Going, Samuel W. Hood, James Duncan and Robert Cunningham. 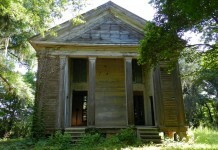 Mrs. Morrow remained with the congregation as Stated Supply until 1844. During this time there were about 100 members added to the church roll on examination. In those days ruling elders really ruled, and not even a member of that august body was exempt from discipline. Offences (sic) which seem trivial to us were considered grievous, and the offender was visited and told of his sin. If he did not render a satisfactory excuse, he had to appear before the session for a trial. Absence from church for several preaching services brought many members before the session for trial. There were witnesses for and against the offender and often these affairs stirred up hard feelings and dissension among the members. Such was the case in Old Oak Grove. An accusation was brought against an elder; his trial made a breach inevitable, and in 1844 Mr. Morrow withdrew from the church together with part of the members. Tuscaloosa Presbytery gave him permission to establish a church six miles from Oak Grove. Failing to comply with the Presbytery’s ruling, he and his sympathizers joined the New School order of Presbyterians and erected what was known as “Hopewell New School Presbyterian Church,” only a quarter of a mile from the old church. When the New School reunited with the Mother Church, Hopewell was dissolved and some of the members came back to Oak Grove. Rev. 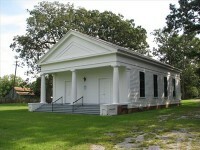 Theodore Sayre served tse (sic) Church as Stated Supply for a year after Mr. Morrow’s withdrawal. Then came Rev. James Somerville, son of ruling elder John Somerville. He was stated Supply from Dec. 1845 to March 1847 and pastor from that date to March 1849. The records show the church vacant from then until Rev. Fields Bradshaw came in March 1851. He served as pastor until he was called to join the Church Triumphant, June 12,1859. During his pastorate, Wm. H. Somerville, B. J. Hughes, S. C. Harkins and Wm. H. Summerville, Jr. were elected elders. Mr. James Knox because of failing health resigned as clerk of the session Dec. 1861 and Ben. J. Hughes was elected to that office. Mr. Watson was pastor until spring of 1867. Rev. W. B. Bingham whose wife was a daughter of one of the first elders— Abraham Turnipseed—-filled the pulpit during the summer and fall of that year. In Jan. 1868 Rev. James Somerville was again called as Stated Supply until 1880 and pastor from April 1880 until fail home (?) in the neighborhood and his salary was $300.00. He was Stated Supply until 1880 and pastor from April 1880 until failing health made him resign April 1883. John K. Spence, Dr. H. D. Boutwell, Wm. B. Somerville, Dr. H. C. Moorehead and John W. Somerville were elected elders during this pastorate. Mr. Hughes resigned as clerk of the session and J. K. Spence took his place, July 1874. In 1873 mention is made in records of stoves being purchased. From April 1883 to August 1884 the pulpit was filled from time to time by Mr. Luther Link, a licentiate, for 3 1/2 months and elder John resigned as clerk of the session and Wm. B. Somerville was chosen. Mr. Spence was connected with the church until he was taken under the care of East Ala. Presbytery in 1886. Rev. R. W. Milner was pastor from Oct. 1884, to Nov. 1886. One outstanding achievement’ of his pastorate was the organization of the Woman’s Foreign Missionary Society of which his wife was the first president. The church was vacant for over a year, then Rev. Robert Morgan was pastor from March 1888 to Jan. 1890. A house and lot were purchased in Franconia to be used as a manse. Rev. Francis McMurray was pastor from April 1890 to 1893. He gave two Sundays to Oak Grove, one Sunday to Carrollton and one to Pleasant Ridge. The Sunday School took on new life, and Children’s Day in June was an occasion long to be remembered. The three churches met together, taking turns in entertaining the other two and all three Sundays Schools had parts on the elaborate program. Miss Charlie McMurray, daughter of the pastor, reorganized the juvenile Missionary band which Miss Nellie Milner had begun and the “Earnest Workers” (the name chosen) were a working organization long after the church moved to Aliceville. Messrs J. J. Gardner and Jas. H. Somerville were added to the Session on July 1890. Rev. Robert Latimer served the same group of churches as Stated Supply from Jan 1894 to October of that same year. Rev. John D. Dean, a native Scotchman, was pastor of the group from March 1895 to March 1905 when he was called to higher service. This was a period of development in every phase of church work. The church was remodeled, the balcony wings being torn out and the back part closed up. The walls were papered, the box pulpit torn down and a platform was erected for the choir in the back of the church. Heretofore the choir had been seated in the middle tier of seats, three seats from the front—a bench having been taken out to make room for the organ when it was purchased. The Woman’s Society was greatly encouraged by Mr. Dean, and when a call came to organize the women of Tuscaloosa Presbytery into a Union, this society was honored by having the first president chosen from its members—Mrs. Jas. H. Somerville. H. H. Gardner, S. W. Hood, John A. Somerville, Sr., Edward and Thomas Salmond, J. Murphy Summerville and Dr. Burwell Carpenter were elected elders during this pastorate. 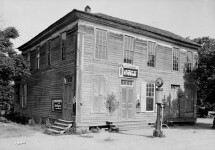 In 1903, Aliceville was settled and some of Oak Grove’s members moved their homes into town. Due to Mr. Dean’s farsightedness, lots were secured and plans formulated to erect a church to meet the needs of the growing town. The task of building it was left for Rev. A. E. Grover who was pastor from Nov. 1905 to 1909. Presbytery changed the group and Mr. Grover and the next two pastors served Bethesda instead of Carrollton. Preaching services were held in Oak Grove Church, but on Sundays when there were no preaching services, Sunday School was held in a warehouse downtown. 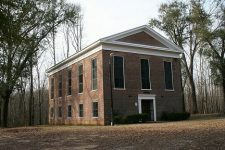 Late in 1908, the building was completed enough to be occupied and all church activities were moved, to Aliceville and the name changed to Aliceville Presbyterian Church. 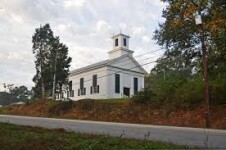 The pastor and his family continued to live in Franconia until Rev. T. R. Best came in Nov. 1909. A lot was purchased at the rear of the church and the present manse erected. Mr. Best’s health failed and he resigned in Dec. 1911. Rev. J. G. Snedecor, Secretary of Assembly’s Home Missions, Department of colored work, filled the pulpit at intervals in 1912. Rev. L. R. Simpson was pastor from Nov. 1912 to 1916. During his pastorate a small pipe organ, the rolling partitions between Sunday School room and auditorium and a piano for the Sunday School room were purchased, adding greatly to the church. 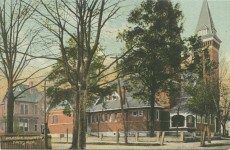 The Primary department of Sunday School, which was organized and directed by Mrs. H. H. Chalmers (Adelaide Dean), was housed in the Sunday School room. The church assumed one-half the support of Miss Annie R. V. Wilson, a missionary to China. Mr. J. N. Morrow was elected elder. Rev. S. B. M. Ghieslin served the church as Stated Supply for several months in 1912. He later went as a Missionary to Cuba. Rev. J. C. McQueen was pastor from Sept. 1, 1918, to Oct. 1922, Mr. McQueen served only Aliceville, and Pleasant Ridge, giving three Sundays to Aliceville. The manse was remodeled. The church increased in numbers and contributions during this pastorate. 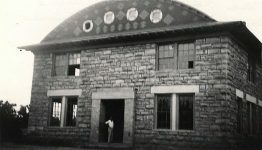 The Woman’s organization which had adopted the Auxiliary plan in April 1918, with Mr. McQueen’s wise counsel was able to meet the Auxiliary requirements and took its place in the foremost rank of Tuscaloosa Presbyterial Auxiliary, a place which the Auxiliary still holds. Rev. Paul Moore supplied the pulpit for several months, in 1923, coming down from Tuscaloosa where he was a member of the faculty of Stillman. Rev. S. T. Hill was pastor from Oct. 1923 to April, 1930, giving Aliceville three Sundays a month. The church was active in every department, the Young People doing especially good work. Again the church and the woman’s organization were honored when Mrs. W. W. Duncan was made president of the Tuscaloosa Presbyterial Auxiliary. At the request of the Executive Board of Foreign Missions, the church took over part of the support of Rev. and Mrs. A. S. Maxwell, Missionaries to Brazil, relinquishing their interest in Miss Wilson. Finding Sunday School quarters cramped, a room was added to the south end of the old Sunday School room,’ for the use of the Beginners Department. Dr. W. W. Duncan and C. R. Horton were made elders in 1924, Dr. C. M. Murphy in 1925, H. S. Summerville and Wm. H. Somerville in 1927 and John A. Somerville, Jr. and Edwin Moody in 1929. Mr. Wm. B. Somerville, clerk of the Session, died July 9, 1927, and J. A. Somerville, Sr., was clerk pro-tern until his death May 20, 1928, when Wm. H. Somerville, the present clerk, was elected. In Dec. 1930 Rev. John S. McFall, Jr., came as pastor. He was greatly beloved by the entire community and his accidental death Sept. 11, 1931, brought to an untimely close what gave promise of being a successful pastorate. Rev. Robert F. Sloop, the present pastor, came to us June 1, 1932, just after his graduation from Union Seminary. The Sunday School is divided into organized departments, with organized adult classes. John A. Somerville, Jr., is Superintendent. The Young People are doing fine work, being one of the banner leagues of the Presbytery. The Woman’s Auxiliary with Mrs. W. W. Duncan as President cooperates with every activity of the church. The men of the church cooperate with Presbytery’s organization for Men. 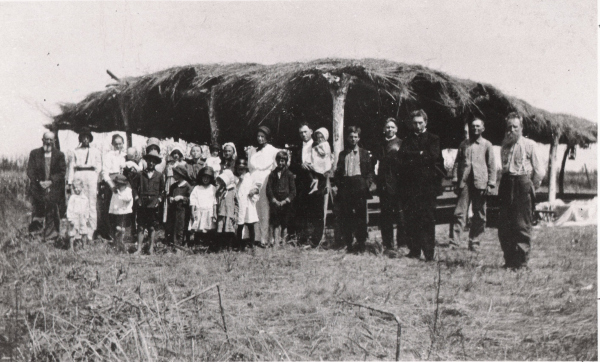 In 1933 the old church building at Oak Grove was bought by the churches of the town and torn down, the timber being used to erect a community church at the Mill Village, southwest of town. In August 1934 the church building was set on fire by lightning and what seemed a disaster really proved a blessing. The building repaired, with a study for the Pastor and classroom added behind the pulpit and redecorated, has been not only more attractive but more comfortable. Last fall a Hammond Electric Organ was purchased which adds greatly to our ministry of song. The church ranks fifth in gifts on Presbytery’s records and the pastors and elders have been honored frequently with Presbytery’s greatest gift, that of representing her as commissioners to the General Assembly. Rev. Robert F. Sloop Pastor June 1, 1932, to date. The church has had a great past and looks forward to the future hoping with God’s help to achieve great things for Him. Rev. John K. Spence and Rev. John Christie McQueen, Jr. I never really knew what a brush arbor (heard in an old religious song) was until I saw this picture! Thank you. 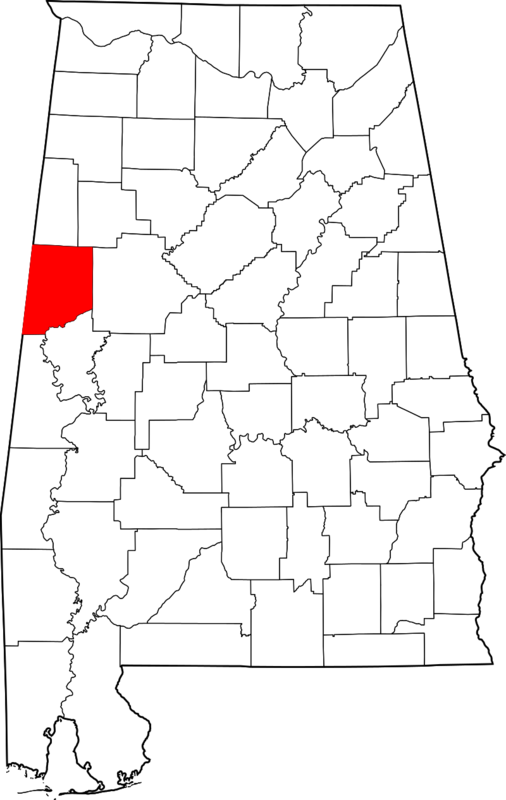 This is probably a rumor..but in Theodore, in South Alabama, there was a congregation that would meet under a tent. They were able to build a chapel when (GULP!!) The KKK gave them $10,000 for their building fund. This was in 1924 on the grounds of the old Carol Plantation. I think the brush arbor was used for revival meetings. It was reminiscent of the old time camp meetings. Pretty sure they had a building for regular services.